This year’s Ventura County Blues Festival was held at the Moorpark College grounds in Moorpark California on April 27th. This event, formally known as the Simi Valley Blues Festival is now in it’s eighth year and without a doubt festival founder Michael John went all out on this one! Each Year Michael has produced one of these events to support the American Diabetes Association. This year’s event started out with Musician, Actor and all around great guy Mickey Jones, who introduced the acts and kept the party rolling. Featured artists included opening act Michael John and The Bottom Line followed by Preston Smith and The Crocodiles, Donna Oxford and internationally known artists such as Savoy Brown, Johnny Rivers and Kenny Neal. The festival held once a year attracts artists who feel the cause is right. Consequently the music is nothing short of great! The music started around eleven a.m. and went to around seven thirty in the evening with a birds-eye guess of an attendance in excess of four thousand spectators and music aficionados. A family friendly event with many vendors and plenty of great food available, the audience was treated to a special appearance by none other than George Thorogood, who wound up doing a few tunes with Johnny Rivers to set the stage on fire and cap off a perfect day of Blues and amazing performances! At the conclusion there was a silent auction for a guitar signed by all of the acts. In my opinion it doesn’t get any better than this. I drove all the way from Washington State to be there among the fans and to hang with my good friend Mickey Jones. I will be more than happy to make a return visit to the 2014 Ventura County Blues Festival. See you there! 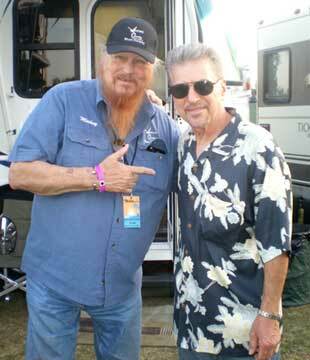 This entry was posted on May 11, 2013 at 11:04 pm and is filed under Blues Festival, Johnny Rivers, Mickey Jones, Uncategorized with tags Blues, Blues Society, Home Improvement, Johnny Rivers, Justified, Mickey Jones, Pete Bilker, Secret Agent Man, Slow Dancing, The Seventh Son. You can follow any responses to this entry through the RSS 2.0 feed. You can leave a response, or trackback from your own site.